Guitarist, composer and educator Jay Umble is the author of several jazz guitar books on Mel Bay Publications and is a featured instructor on online jazz education site Mike's Masterclasses. Jay is also an adjunct faculty member of Bucknell University and Susquehanna University in Pennsylvania. An active performer and recording artist, his latest CD is entitled Spirit Crossing. Jay was kind enough to grant The Guitar Column this email interview recently. The Guitar Column: Who were your guitar heroes when you were growing up? Jay Umble: I grew up in the rock genre so I was really into Eric Clapton, Jimi Hendrix, Jeff Beck, etc. I was always more interested in the instrumental, improvisational side of music. I recently went to a Jeff Beck concert and was totally blown away. Jeff is as relevant today as he was many years ago. TGC: What sparked your interest in jazz? JU: A friend of mine asked me if I had ever heard of George Benson and I said that I knew his name but that was about it. So he put on this album called Body Talk and it totally changed my way of thinking about what the guitar could do. I remember upon my first listening of this album thinking, 'I can’t believe somebody can play so hip without distortion!' It just knocked me out! So from that point, I started gravitating towards the jazz side of things. TGC: Who were some of your early teachers and mentors? JU: I studied with some great teachers/players in my area, early on in my development. Kenny Gehret was one of those teachers -- he is now playing a ten-string guitar -- who was really coming from the artistic side of things. I also studied with Marty Bonk who was so wonderful at explaining the process of jazz thinking. Both were great teachers, but having totally different perspectives. Of course, I was constantly transcribing licks off of records -- all the great jazz players of the day – Tal Farlow, Barney Kessel, Herb Ellis, etc. You learn so much from the transcribing process. Someone once told me that all of the answers are on the records. TGC: You went on the road with the Ron Smith Trio, an organ-based group, when you were still in your 20’s. Did you enjoy playing in a Hammond B3 based trio? JU: Yeah, there’s nothing like the Hammond B3 sound and it was an awesome experience overall. Ron’s feel was so 'in the pocket' and he was such a master player. He knew all of the tunes -- one of those guys ya know! -- so it was a real workout for me, a lot of on the job ear training. I’ve always been appreciative to Ron for that opportunity because I was just a young, inexperienced player - but I really wanted it man! TGC: You eventually went on to study with Pat Martino – one of our great masters. How did you get the opportunity to study with him? JU: Actually it came about from my involvement with the organ trio. Through Ron Smith I met Chris Jones (son of Philly Joe Jones) who introduced me to Pat Martino. It was really weird and funny because me and a friend of mine went to meet Chris in south Philadelphia. We met at this old abandoned warehouse. It was a total trip – it was like out of a movie! And then Chris calls Pat and tells Pat that this guy wants to study with him. So Chris gets off the phone with Pat and gives me Pat’s phone number. And that was it. It’s really funny how this came about! The funny thing is, is that after studying with Pat for a while I asked him one day about getting in touch with him and Pat said, "You could have just looked me up in the phone book"! Now you gotta love that! TGC: What was a typical lesson with Pat Martino like? JU: Studying with Pat was a phenomenal experience. Lessons were a combination of music and philosophy – totally integrated. Pat liked to discuss concepts in addition to writing out specific musical ideas. He also shared a lot of his music with me. Much of this music hasn’t been released to the public. But anyway, Pat presented so much information for me to study. Every lesson was intense and I would leave each lesson being totally exhausted! Of course we worked with his Nature of Guitar concept, learning the entire neck from a minor perspective, chord substitution, phrasing, compositional techniques and so on. Studying with Pat was one of the best things I’ve ever done. TGC: Do you have any great Pat Martino stories for our readers? JU: I have so many great Martino stories and I often share these stories with my students. Here’s a great example: Pat showed me an orchestral work that he had written called Opus 126 -- it was something like this -- I don’t remember the exact number. The obvious implication is that there must be 125 other opuses that precede Opus 126! I made a comment to this effect and Pat looked at me with this smile on his face and said, “It’s just a title!" Then we both started laughing. It was great! In this same orchestral work, Pat pointed out the tempo of the first movement which was quarter note equals 96. Then Pat said, check this out – he turned ahead to the second movement and pointed to the tempo which was quarter note equals 97! That’s funny stuff! TGC: You’ve written a number of jazz guitar books. Your Mel Bay book Jazz Guitar Licks In Tablature was interesting for me as it was devoted entirely to the use of the whole-tone scale. Not your usual compendium of ii-V-I licks as the title would suggest. Which was cool as the whole-tone scale doesn’t even get it’s own chapter in most jazz method books out there. JU: Well that’s interesting about the title of the book. I had wanted to call the book something specific to the whole-tone scale but it came down to a corporate decision and that’s ok too. So anyway, I was working a lot with the whole-tone scale at the time and decided to put the ideas in a book format. The whole-tone scale is, to me, nothing more than a sound texture. Sometimes as musicians, we can get too locked into theoretical considerations and lose sight of the fact that we are dealing with art. So for me, the whole-tone scale can be used in other harmonic contexts to create an effect, in addition to being used in the dominant 7th b5 or dominant 7th #5 harmonic areas. TGC: You must have a pretty good relationship with Mel Bay Publications judging by the number of books you have in their catalog – Jazz Guitar Licks In Tablature, Improvisational Techniques For Jazz Guitar, Melodic Junction, The Jazz Guitarist’s Thesaurus and Payin’ Your Dues With The Blues. JU: Yes, I have a good relationship with Mel Bay which I’m very appreciative to have. They are an excellent publishing company and treat their writers with respect. As far as publishing goes, I think that as long as you have something to say and can present your book concept to a publisher in a coherent fashion, they will give you serious consideration for publication. Only two of my books remain in print -- 'Improvisational Techniques For Jazz Guitar' and 'Payin' Your Dues With The Blues'. 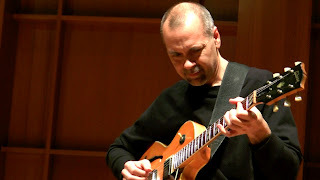 Improvisational Techniques For Jazz Guitar presents many concepts such as Double Stops, Arpeggios, Chromaticism, Random Open Strings, Side-Slipping and more. Payin’ Your Dues With The Blues takes an in-depth look at the jazz blues idiom and covers such things as comping, soloing, various harmonic blues forms, walking bass lines, chord soloing and more. TGC: I haven't gotten a hold of Improvisational Techniques For Jazz Guitar yet, but I did get a lot of mileage out of Payin’ Your Dues With The Blues – lots of great substitution ideas that I found myself using immediately on the bandstand. I think it was Hal Galper who said that if you get one usable idea out of a book, it was a good book; and if you get two or more usable ideas out of a book, it was a great book! JU: Thanks so much! I put a lot of effort into this book. I really wanted the material to be real music, things that you would actually want to play as opposed to generic type of information. I’ve gotten many positive responses to the book in this regard. I totally agree with Hal Galper. Now that you mentioned Hal, I encourage everybody to check out his YouTube master class videos. These videos are ESSENTIAL to any serious minded musician. TGC: Do you have any new books coming out? JU: A lot of people ask me this question. No new book concepts at the present. I do have other book ideas but haven’t moved in that direction for the time being. TGC: To date, you have six videos on Mike’s Masterclasses. How did your association with Mike Gellar come about? JU: I met Mike many years ago at a jazz festival. He was staying at the hotel where the festival was held during the festival weekend so we did some playing in his hotel room. Years later, after Mike started this Master Class concept, he called me and asked me if I would like to be involved, so I said 'Sure'! Mike has developed a wonderful jazz video lesson company and I am honored to be a part of his venture. I will be doing two Master Classes soon that deal with the psychological aspects of performance, philosophy and methodology. These two classes will be quite interesting. I’ll be covering many things that you almost never hear about and some things you never hear about! I’m very excited to be presenting these concepts. The classes will be called 'Let’s Talk: Music, Psychology, Methodology and More, Vol. 1 & 2'. TGC: You teach at both Bucknell University and Susquehanna University. Could you describe the courses you teach there? JU: I’m an adjunct faculty member and I’m teaching studio guitar, which really means teaching students one on one. I see my role, while at the universities, to impart as much knowledge as I can about the entire musical experience. So my students get a lot from me! TGC: What is your approach to teaching jazz guitar and what are some of the personal musical philosophies you hope to pass on to your students? JU: I place a heavy emphasis on harmony which is an area that most students need a lot of help with. I provide a healthy dose of traditional and modern harmonic systems with practical applications. I also work on soloing over changes. Most students feel pretty comfortable soloing over a static vamp -- and some students are incredible at this -- but are totally lost when given an actual jazz chord progression. One of the techniques I find helpful is the concept of 'soloing off of the chord' – in addition to the obvious things such as scales, arpeggios and the like. The most important thing I can convey to a student is this: The guitar is not music, it is just a piece of wood with six metal wires. It’s just a tool, an “instrument” if you will. That’s all! You are the music: the tool simply gives you a means to process what is in your heart and soul. The guitar is a canvas on which we paint with sound – sound that comes from within our being. We ARE the music! This shift in our perception, in relation to the guitar, makes all the difference in the world. If you make this shift in perception, you will be a far more creative musician. Instantly. TGC: Tell us a bit about your current groups, String Theory and The Jay Umble Jazz Trio. JU: String Theory is one of my groups where it’s all about original music. I love playing jazz standards and I also love having the outlet to play my own tunes. So it’s very rewarding. The Jay Umble Jazz Trio is a standards trio with my own modern flair thrown into the mix. Playing standards really keeps me 'in tune' with music. To me, jazz standards are so very important. TGC: You also have a duo with guitarist Bill Druck. JU: Yes, I work in a jazz guitar duo project with guitarist Bill Druck. We get into a lot of textural type of music and avant-garde material, some of which is totally improvised. So these three groups offer quite a spectrum of concepts. TGC: You also have a new CD out, Spirit Crossing? JU: Yes, it’s a project of original compositions that I wanted to do for a long time. TGC: What was your compositional process like for writing Spirit Crossing? JU: I had worked with some Ralph Towner harmonic concepts over the years and kind of developed those concepts into my own thing. I built tunes around various chordal ideas from a finger style perspective. The original plan was to do the album based upon a two guitar concept. But you know how these things go – it morphed into something much larger than originally conceived. But I like the way it turned out. It has a very unique world vibe throughout. Jamey Haddad played percussion on the album which really helped to give it that common thread. TGC: What did you use on that recording by way of guitars, pedals and amps? JU: I used a lot of stuff man! Guitar wise, I used my Gibson ES175-T, Carvin SCS-90, Larrivee acoustic, Fender Strat, banjo and a few other guitars that I borrowed from friends. All of the acoustic guitar material was done by miking the guitars naturally with multiple mics for sound options – options are good! A couple things were recorded direct, but not much. Other than one electric guitar solo, all of the effects were added after the fact. But the pedals I did use on that solo were a Whammy pedal, Ibanez chorus, Boss DD6 delay and a Rat distortion pedal. Regarding amps I used my Polytone Mini Brutes, Roland JC-120 and an assortment of other amps for re-amping. TGC: Describe your most memorable gig experience, good or bad. JU: I was playing this organ trio gig one time and this guy walked into the club and was just staring at the band. Then all of a sudden he walked over to the organ player and literally pushed him out of his seat and took over! It turned out to be Cedric Lawson, who worked with Miles Davis, and he tore the house apart, so to speak! The energy was totally over the top. Everybody was freaked out - in a good way! TGC: Thanks so much for doing this interview Jay! Any parting words for our readers out there? JU: Thank you Clinton! It was my pleasure. Sure, I would like to simply say this: Accept however it is that you play and go with it. Don’t worry about what everybody else is doing. Just believe in your concept of music. I know this sounds trite, but it is so true!! I'd been meaning to order a batch of these for several months now -- The Guitar Column's very own custom pick! 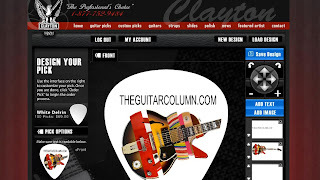 And after perusing the net for possible vendors, Steve Clayton's Custom Pick Designer site had me hooked with its online custom design feature. All I had to do was choose a pick shape, gauge, material and color, upload a graphic and add text using the super-friendly, easy-to-use online software. The only time-consuming part was deciding on the font and tweaking the size and orientation of the graphic a myriad of ways before settling on the final design. Actually, this creative bit was also the most fun! I chose to go with 1.26mm white Delrin and a single-sided full-color graphic. My only wish was that the software allowed me to curve the text along the outline of the pick. I'll do a review of these picks when they arrive. Can't wait to start throwing these out at gigs!